You know... I am amazed every day... amazed at how powerful prayer is. I want to thank each and every one of you who pray for our Ana. It is because of your faithfulness and God's mercy that she is with us today. Her life is my testimony... her smile is a beautiful reflection of God's grace... so sweet. Ana realized she was a lost sheep very early in her life and the Lord found her so fast. She knows that the moment she dies she lives... in heaven... She knows that Christ died that she might have life eternally... His death on the cross paid the price for her sin and she knows it... He died so that she wouldn't have to... He died so that she could live forever with Him... to hear her talk about heaven and God is amazing. Last year at this time she was sad. Not because of hospital stays and feeding tubes... not because of carrying a backpack 24/7... not because of mitochondrial disease, she was sad because she couldn't be baptized. Ana had a central line (like an I.V.) in her chest and she couldn't get wet... she couldn't get baptized... She knows that baptism doesn't save... she knew it wouldn't get her to heaven... Only Jesus Christ could do that. Ana wanted to be obedient. She simply wanted to honor God and obey. Jesus taught that a Christian must FIRST believe and THEN be baptized. Baptism is a mere symbol of ones relationship with Christ... One doesn't wear a wedding band before marriage and one doesn't get baptized before believing. The only thing she could do about it was pray. She prayed night and day... day and night... that the leg pain would subside and the central line would be removed long enough for her to be baptized. It was so sweet... her faith... she asked believing... and God answered. In July the line was removed... in November she met with Pastor Broggi and went public with her decision... and in the coming weeks she will be baptized! She is SO EXCITED! It is all she talks about... all she thinks about... all she cares about. I am so happy for her... so happy her desire to please God is so deep. What a special day it will be... and yes, you are all invited! I will post the time and date next week. 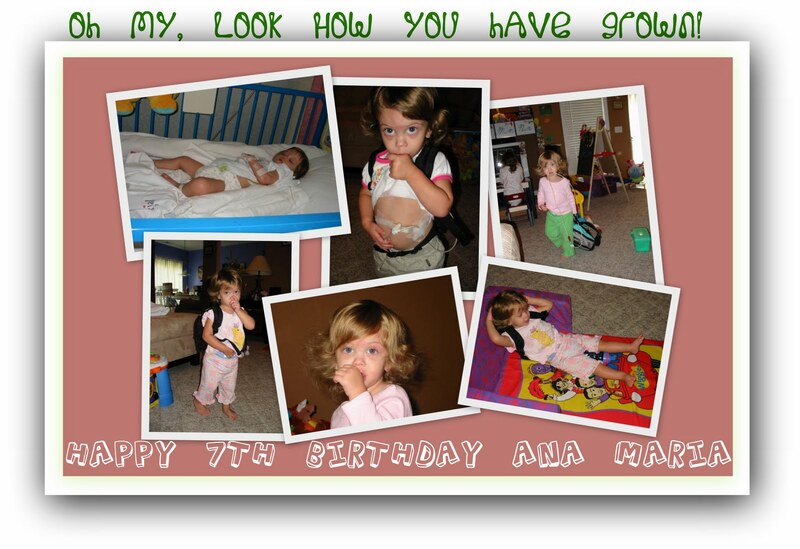 HAPPY 7TH BIRTHDAY ANA MARIA!!!! I WISH WE COULD BE THERE TO CELEBRATE WITH YOU. WE WILL BE DOWN THIS SUMMER SO WE CAN VISIT WITH YOU ALL. MAYBE WE CAN DO 2 WEEKS THIS TIME. WE WILL SEE. I AM SO HAPPY YOU ARE FINALLY GETTING TO BE BAPTIZED. I LOVE YOU ALL VERY MUCH AND MISS YOU EVEN MORE!! TAKE CARE MY SWEET GIRL AND KNOW YOU ARE LOVED A LOT!! Just wanted to say hello and to tell Ana that my neice Mikaela, Tori and I are going to start volunteering once a week for Pegasus Farm here in Ohio. This is the same as Heroes on Horseback there. The girls are very excited to be helping with the horses and kids. I will send pictures once we get started. We have orenitation on Feb. 15. Take care and her everyone my love! !